Ad automation rules can free you up from constantly tracking your ads performance, as you can just set the rules that are activated when your ad meets defined conditions. E.g. if your ads performs poorly, they can be paused and vice versa, when they're doing great, you can increase budgets, launch previously paused campaigns or duplicate ad sets. Revealbot Automation also sends notifications to email and your team’s Slack where you and your team can see why an ad was paused right away. How does Revealbot automation work? Automated rules by Revealbot (as well as other Revealbot products) are based on Facebook Ads API and you only need to connect your Facebook ad account to Revealbot. Below, we will show the elements of the New Automated Rule page and explain what each of these items is responsible for. It's recommended to come up with a concise and distinctive name to easily navigate through your list of rules. Note: You can connect only one Facebook account to Revealbot but there is no limit on how many ad accounts you connect to Revealbot. This is the section where you define what exact instances you apply your rules to, whether it’s all campaigns, certain ad sets from different campaigns or a specific ad. You start with defining the level that the rule is applied to. If you choose campaigns, Revealbot would apply to all the campaigns that you pick. If you pick advert sets, your rules would be applied on an ad set level, so if you select a campaign from the list below, the rule would be applied to all ad sets in that campaign. The same logic applies to ads. After defining the level, you can pick specific campaigns, advert sets or ads from the list or you can select items by name. If you choose the latter you'll have an option to use a "name contains" filter so that the rule would apply to the campaigns/ad sets/ads that contain certain words or symbols. Note: you can choose ads from multiple advert sets, i.e. pick a couple from one advert set, then go to another adset and pick ads there. We got to the core, tasks and conditions. Then you create the logic of a rule. You can have multiple conditions in your rule and you can define whether you need all of them to be met in order for the rule to be triggered or at least one of them; also, there can be a set of nested conditions with their own and/or structure. You can see an example of a rule on the screenshot below. That rule will pause an ad set if it spends more than $50 today and if the CPC (cost per click) for that ad set is greater than $3 today. 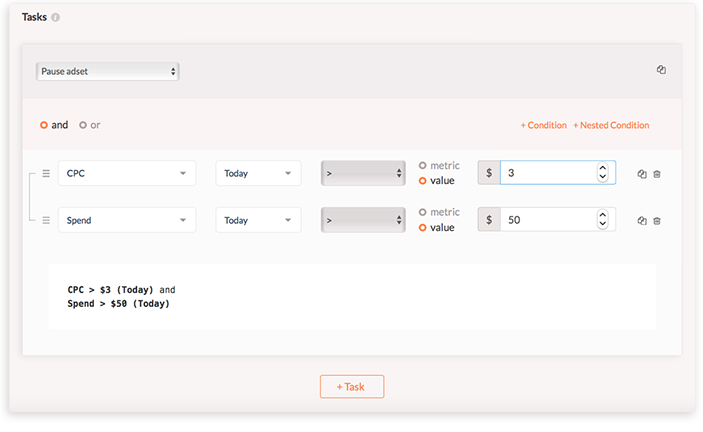 As you’ve probably guessed from the +Task button, you can have multiple tasks added within one rule. But for the clarity it's probably better to keep different tasks in different rules - that way you can keep track of how each task works via the logs of the rule. You can choose how to attribute user interactions with your ad separately for views and clicks. E.g. if you keep attribution window as 28 days after clicking an ad and 1 day after viewing ad and your user converted within that period then that converted customer will be attributed to that ad. But if a user becomes paying customer on a second day after viewing an ad or 30 days after clicking on it, then that converted user won’t be attributed to the ad you set the rule for. You can choose where you want to be notified once the rule is triggered. In our example we’ve picked marketing channel in Slack, so that the whole marketing gets an alert when something is up. Here you define when and how often your rule will check the conditions. 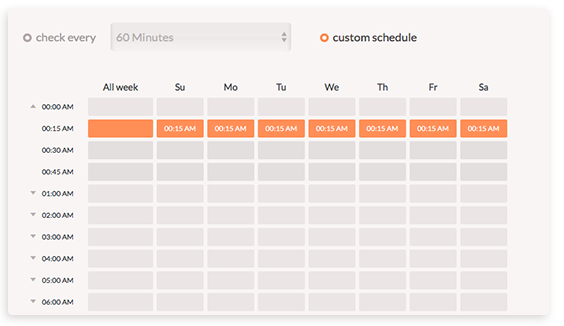 Revealbot picks your current time zone by default so be aware it can differ from your ad account time zone. You can choose to check the conditions with certain frequency from 15 minutes to 72 hours. Once you submitted the rule it'll run right away with the frequency you set. The other option is to run your rule at specific times. On the screenshot below the rule is set so that it'll run at 00:15 once every day, but you can set it up any way you want. You can also limit the date range when the rule is active. Or you can leave run continuously setting and the rule will stay active till you turn it off. 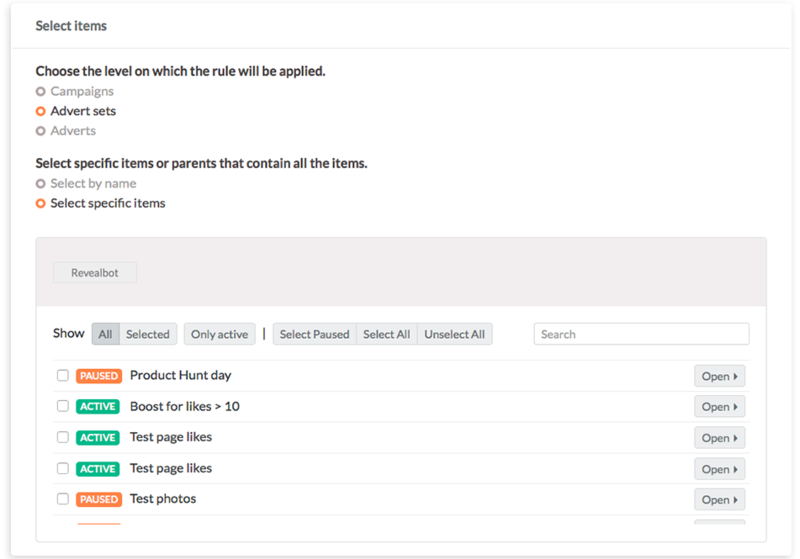 Once you've created the rule, Revealbot will keep checking your campaigns to see whether they meet defined conditions. Once the conditions are met, your rule will be triggered and you'll get a notification in the Slack channel/email you picked. Ready to create one yourself?